SentryOne Test is a data validation framework that allows you to implement MSTest and NUnit data-focused testing for your database environment. SentryOne Test integrates into build and automation processes, and provides the ability to schedule test runs, as well as dashboards that display test success metrics and the data behind test failures. The SentryOne Test Visual Studio Extension brings data validation testing within the Visual Studio environment. Create SentryOne Test projects based on the MSTest or NUnit frameworks from scratch or with a recipe. Tests can range from simple row-count comparisons to implementing complex row-by-row, column-by-column data comparisons. The SentryOne Test Visual Studio extension allows you to implement these tests without needing to write complex logic for key matching or data comparisons. Within the extension, you can define setup and teardown steps to execute at different parts of the testing process. You can also call REST APIs, execute SSIS packages, or run SQL statements before and after each test or group of tests. Execute SentryOne Test projects as part of a CI/CD build pipeline, integrated with the SentryOne Test Web Portal, or published to the portal and scheduled through the Remote Agent. For more information about installing the SentryOne Test Visual Studio Extension, see the Installing SentryOne Test article. The SentryOne Test Web Portal includes a full API layer, allowing you to deploy test projects to SentryOne Test and then call them programmatically if desired. The SentryOne Test Web Portal has dashboards that display test activity across all the projects that are deployed and have been configured to publish data to the SentryOne Test service. From the main dashboard, drill down into the test failures and see exactly why tests are failing, including the data behind the test. Integrating with a Remote Agent allows for tests to be pushed out and executed on remote servers, while providing access to centralized results. Note: It’s possible to have a mix of MSTest and NUnit tests deployed to SentryOne Test. Allocate and schedule tests on the Remote Agents to schedule data validation tests on production business data and to share the results simply and easily with business users. 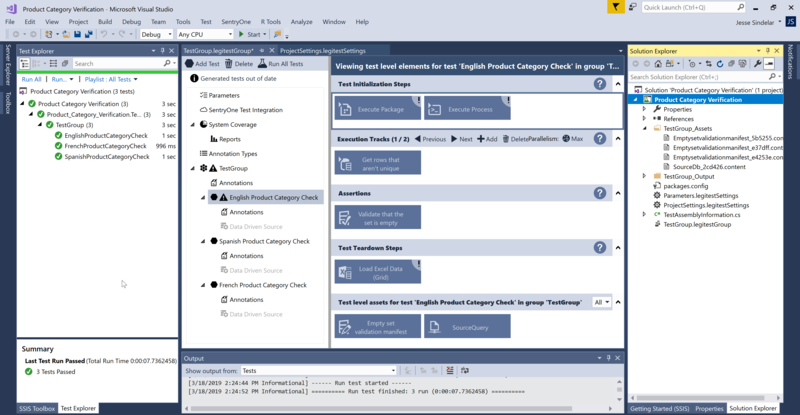 Within the web portal, you can create tests using the SentryOne Test recipe framework allowing you to build test criteria without Visual Studio. 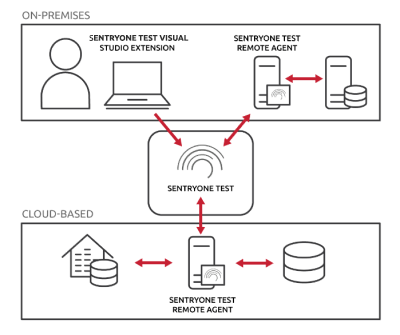 Ensure that access to your data takes place in your environment by deploying the SentryOne Test Remote Agent close to your data sources in the cloud or on premises. With the Remote Agent installed locally as a Windows Service, you can constrain access to accounts and systems where you have full control. For more information about installing the Remote Agent, see the installing SentryOne Test article.